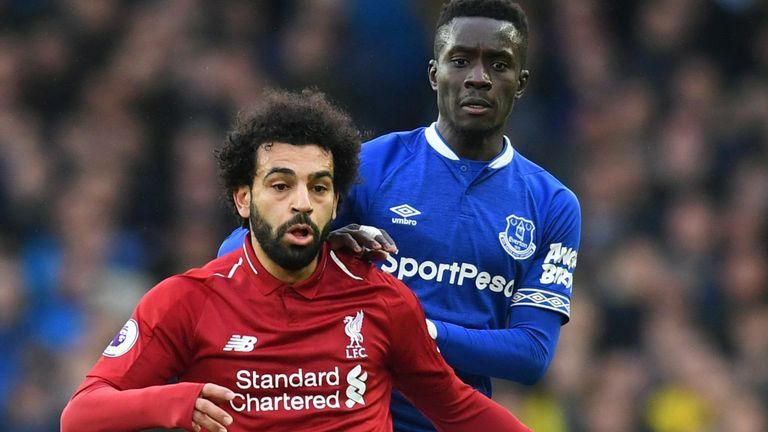 Liverpool missed the chance to return to the top of the Premier League as they were held to a 0-0 draw by Merseyside rivals Everton at Goodison Park. Only a victory would have seen Jurgen Klopp's side reclaim top spot from Manchester City after their win at Bournemouth, but the Reds came up short against a stubborn Everton side who took great pride in halting their neighbours' title challenge. Mohamed Salah had two clear opportunities to send Liverpool back to the summit but his touch in front of goal was characteristic of a game lacking real attacking quality. Liverpool stay second, a point behind champions City with nine games remaining. Everton, who are now without a win against their rivals in 19 games in all competitions, remain in 10th position. 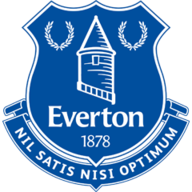 Everton: Pickford (6), Coleman (6), Keane (7), Zouma (7), Digne (6), Gueye (6), Schneiderlin (6), Walcott (6), Sigurdsson (6), Bernard (7), Calvert-Lewin (6). Subs: Gomes (5), Tosun (5), Richarlison (6). 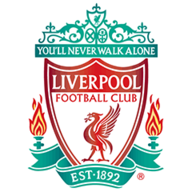 Liverpool: Alisson (6), Alexander-Arnold (6), Matip (6), Van Dijk (8), Robertson (6), Henderson (6), Fabinho (6), Wijnaldum (6), Mane (6), Salah (6), Origi (5). This Merseyside derby was no different to the 232 that had come before, full of passion and conducted at a relentless pace, but it lacked one thing - end product. Salah fired a shot straight at Jordan Pickford on the quarter hour and it was another 15 minutes before the next chance arose. Sadio Mane released Salah through on goal, but Pickford prevailed for the second time, staying big to thwart the Egyptian's strike before Jordan Henderson's attempted rebound was blocked. Theo Walcott fired wide at the near post as Everton registered their first attempt on goal seven minutes before half-time. Seven minutes after the break, Dominic Calvert-Lewin found the target for the first time, but his header was straight at Alisson. Liverpool responded as Trent Alexander-Arnold fired a free-kick straight at Pickford and Divock Origi pulled a shot wide at the near post, before Joel Matip released Salah through at the end of a marauding run, only for Michael Keane to nick the ball off his toes just as he prepared to pull the trigger. Everton welcomed Kurt Zouma back from suspension while Bernard replaced Richarlison as Marco Silva made two changes following the win at Cardiff. Captained Jordan Henderson returned for Liverpool, replacing James Milner in their only change from the win over Bournemouth. Roberto Firmino was introduced after the hour-mark and he almost had an immediate impact as he combined with Mane and Salah on the counter and lofted a cross to the back post, but Mane failed to find the target with a header. Fabinho spurned a gilt-edged chance to put Liverpool into the lead on 67 minutes when he opted against shooting first time after Virgil van Dijk's knockdown in the Everton area, allowing Seamus Coleman to intervene with a last-gasp challenge. Liverpool's Virgil van Dijk (left) battles for the ball with Everton during the Premier League match at Goodison Park, Liverpool. Both sides pushed for a late winner, Van Dijk unable to stretched far enough to get his head on a cross into the Everton area, but there was no late drama like the reverse fixture in December, a frustrating draw handing City the initiative in the Premier League title race. 34 of the 200 league meetings between Everton and Liverpool have finished goalless, 15 more 0-0s than any other fixture in English league history. Liverpool have failed to score in two of their last three Premier League games, having failed to find the net in just one of their previous 27 in the competition. Three of the last five Premier League meetings between Everton and Liverpool at Goodison Park have finished 0-0. This is the first time Liverpool have not finished a day top of the Premier League table having played the same number of games as Manchester City since December 7th. Liverpool didn't record a single shot on target after Trent Alexander-Arnold's effort in the 54th minute of this match. 67% of Everton's three shots on target in this match came via their substitutes (one for Richarlison, one for Cenk Tosun). Mohamed Salah has gone three Premier League games without a goal for the first time as a Liverpool player. 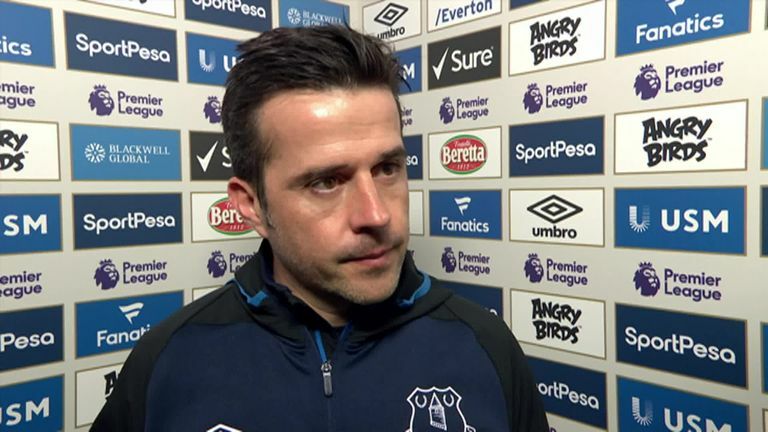 Marco Silva: "Both teams wanted to win, both teams had dangerous crosses, but we were the better team in the second half. What I wanted to give the fans was the three points, but we gave them a good performance and desire. We showed a good attitude and they want to see that always. The atmosphere in the stadium was fantastic. The fans can push our team to win, not just this game but any game - they were the 12th player on the pitch." 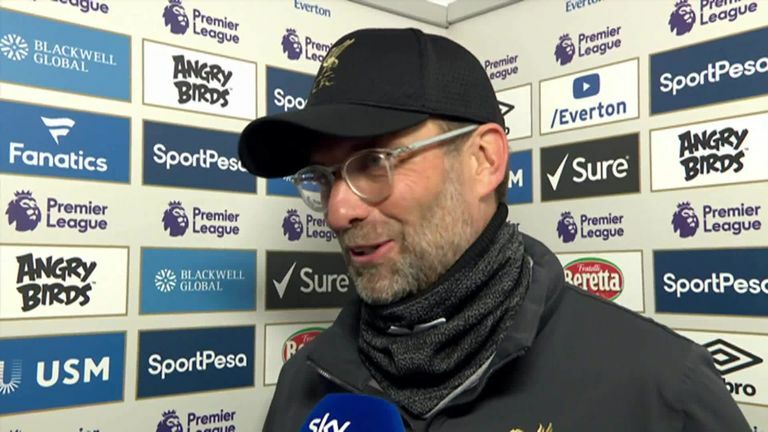 Jurgen Klopp shared his thoughts after his Liverpool side drew 0-0 with Everton that meant Manchester City remained at the top of the Premier League table. Jurgen Klopp: "It was a difficult game for different reasons and a wild opponent. It was a game that was difficult to control yet we had three or four really big chances with Salah and Fabinho, I don't remember them having any chances. We have to take the situation as it is. We have to show stability and fight for the result." It wasn't the result Liverpool wanted but yet another flawless performance from the Dutchman would have eased any lingering disappointment. Everton were full of effort and energy and up for the battle as their title-chasing neighbours made the trip across Stanley Park, but Van Dijk's calming influence at the back singlehandedly kept them at arm's length as the Reds claimed a 17th league clean sheet of the season. Everton travel to Newcastle on Saturday (3pm GMT) while Liverpool host Burnley on Sunday (12pm GMT) in the Premier League.